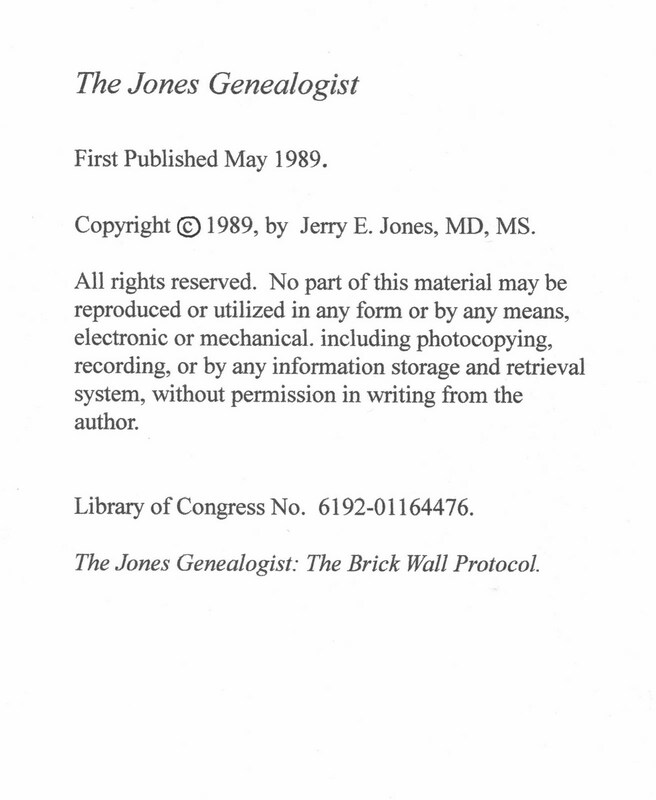 Frequently, "brick walls" present themselves to the genealogist. How to go around or demolish them becomes quite a task. Having faced many such "brick walls" in my 50 some years of doing genealogy on the surname JONES, I have come to accept them as part of tree climbing. The following blog will present what I have used to help get over and around these proverbial "brick walls". 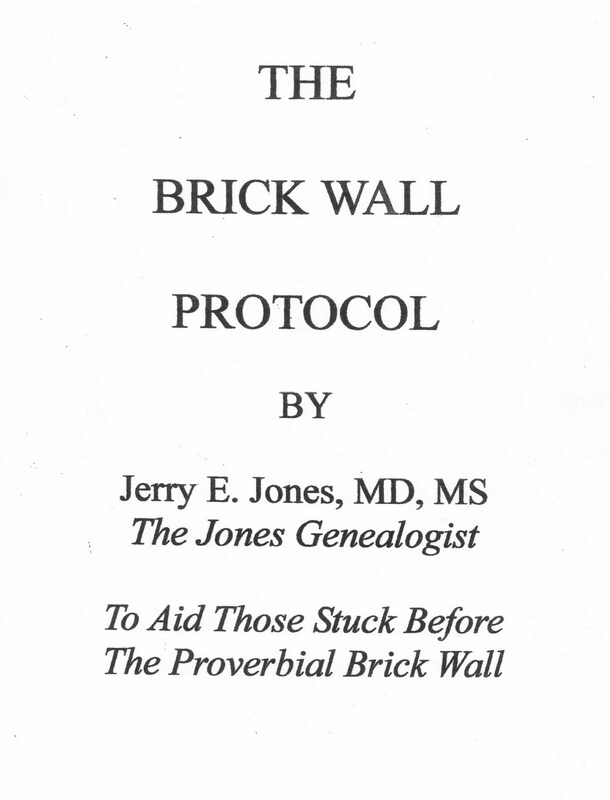 It is intended to be a help to those who wish to continue their genealogical experience in spite of facing a wall. It is called The Brick Wall Protocol. It will be presented as I have developed it in a "work book" approach. The pages of the work book will be presented as if you are using the actual protocol intended. The pages and text will be published as designed. 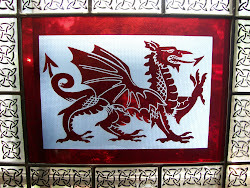 Each post will have a number identified as "BWP(#)" so that a reader can following in order. 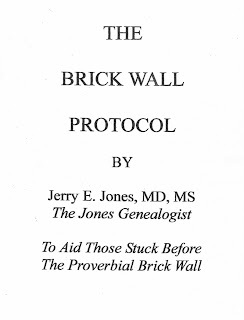 This is BWP(1), meaning "Brick Wall Protocol, reading #1. Post will follow in sequence so that the reader will be able to utilize the information as intended. 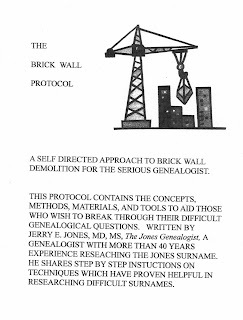 The pages will be presented in order and hopefully make sense to the frustrated genealogist. They should be used in sequence to be most helpful. Please make any comments or suggestions using the comment space at the end of the post. The first three figures show the title page, purpose, and copyright. First published in 1989! The next post will describe "Step 1". 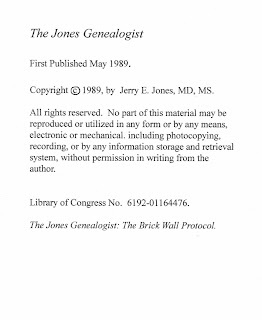 I trust this protocol will be helpful to genealogist for generations to come. Just found your blog, am ready to get started on breaking down my brick walls. Thanks.